Acura models are generally regarded as good cars for various reasons. Besides being nice-sized cars with a professional-looking design, they are also renowned for their handling and performance. Thus, buying a used Acura TL is an option for many, since it is a solid mid-sized model. The Acura TL was introduced in 1996 and various generations have been introduced since then up until 2013. However, if you cannot afford the 2013 Acura TL you do not have to worry. There are several used Acura TL versions that were launched in previous years that still have great features. This mid-sized sedan is quite luxurious. Even the 1996 version is considered to have a professional look. This was also referred to as Honda Saber and it came with a 4-speed automatic transmission. 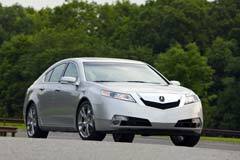 The second generation of Acura TL was launched in 1998 and since 2000 they came with a 5-speed automatic transmission. There is also a third generation which was released in 2004. These also came with a 6-speed manual transmission. 2014 TL Special Edition 2014 Acura TL Special Edition 33253 Miles Silver 4dr Car Premium Unleaded V-6 3.